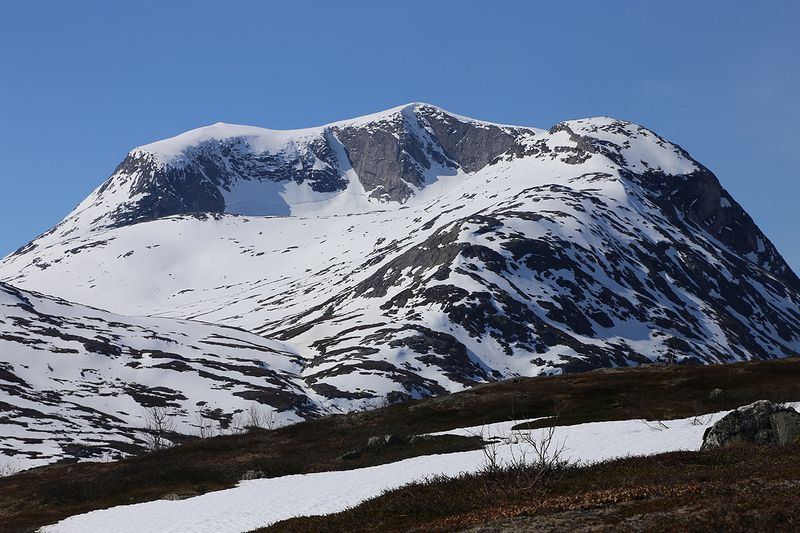 This mountain is south-east of Narvik. If you drive Hwy. 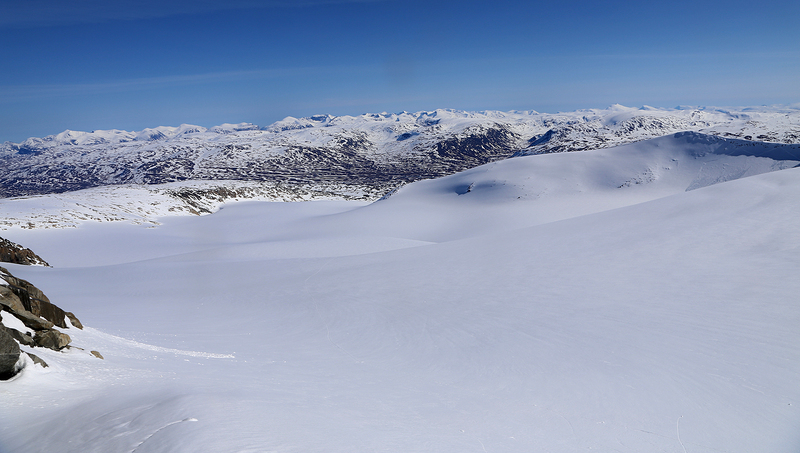 6 south from Narvik, the first fjord you get to is Skjomen. The Hwy. crosses this fjord on a big bridge. Do not cross the bridge, but turn left and drive along the north side of the Skjomen fjord. 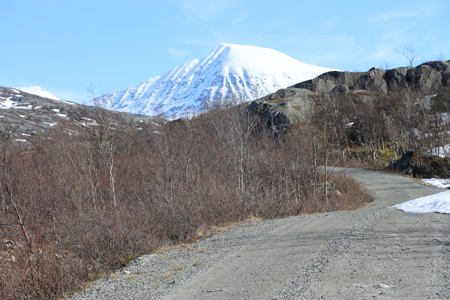 When the road leaves the fjord you are in the small community Skjomen, continue straight ahead along the main road. Ignore the signed road going right to Sørskjomen. After quite a long drive, the road bends right and crosses the main river on a bridge. (Well before this point, there is a sign telleing that you enter a private road) There is a turnout on your right hand side with some information signs. One may consider parking here. Shortly further along there is a signed intersection, with Norddalen going left. You will then have a big power transformation station on your right while the road to Norddalen continues straight ahead. This road may be closed by a locked gate. This gate is at location N68.16071, E017.56677, elevation about 100 meter. If this is the case, consider the previously mentioned turnout as a place to park. 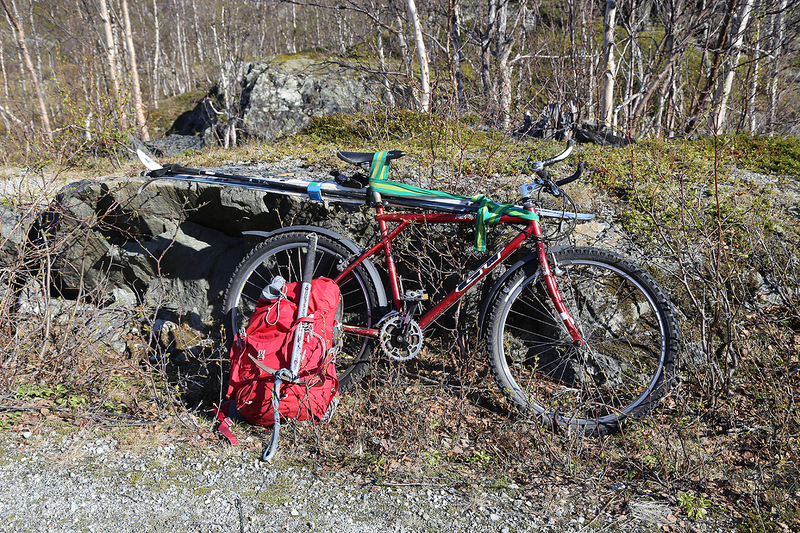 Unless you are prepared for a very long hike (possibly with an overnight), then strongly consider to have a bike that may be used on the Norddalen road. If the road is open and free of (blocking) snow, then continue along this road, see more info under the route description below. 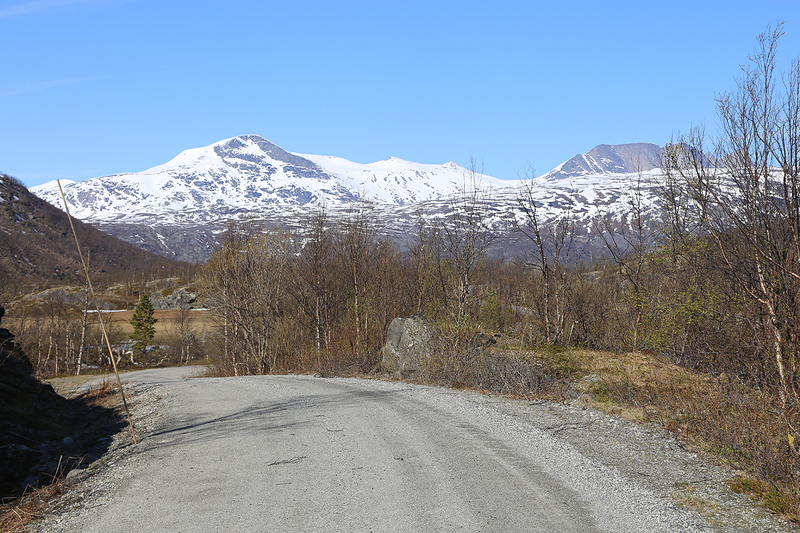 This description starts at the beginning of the Norddalen road. Walk/bike around the (locked) gate and continue along the dirt road as it turns left and starts climbing. 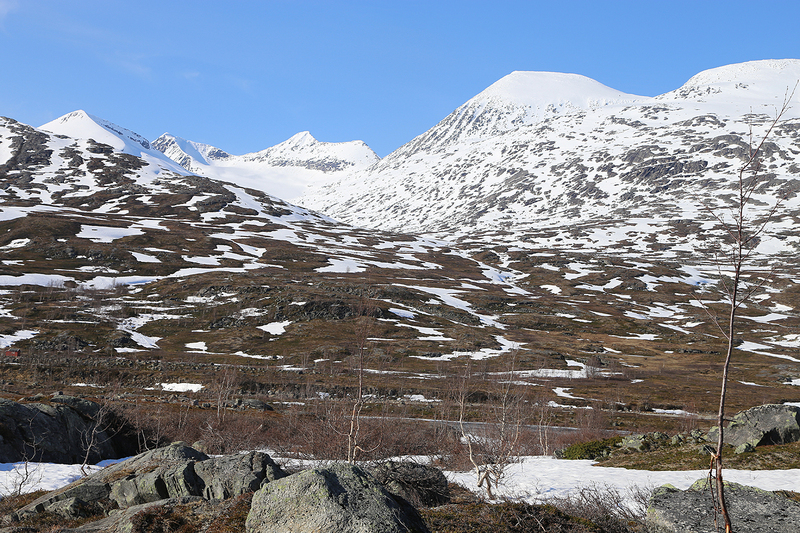 The most sustained uphills are indeed in the beginning, the road climbs up in the slope on the right hand (south) side of the Norddalen valley. The road has some more level sections, even a few small downhills, but the general trend is a gentle uphill. 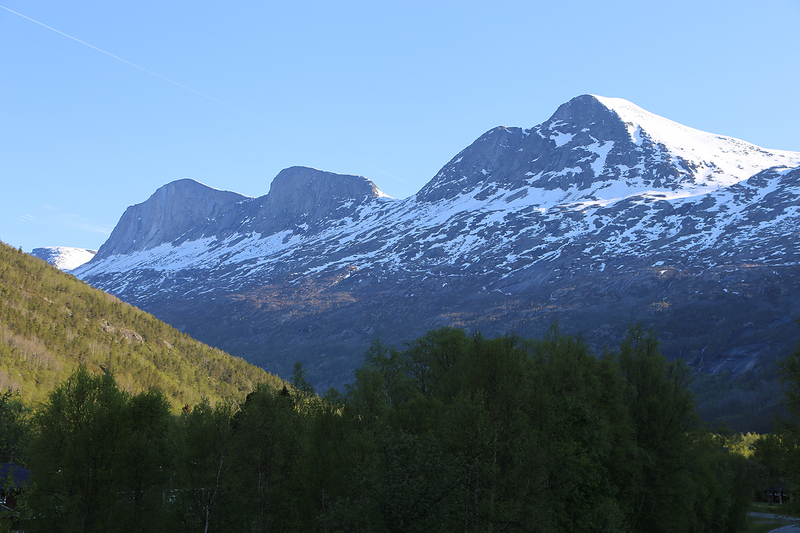 After a while, Storsteinsfjellet (not the summit) becomes visible ahead on the left side of the valley. Quite high up, there is a road fork, take the right road that heads uphill at this point, the left fork dead-ends very shortly. When you reach location N68.17575, E017.84574, elevation about 650 meter, you are directly opposite the small side valley that is part of the route. One may decide to leave the road here, hike down to the river and cross it very near a point where you see a small red hut on the far side. There are many rocks in the river at this location, they help make a crossing quite feasible. If the river is high, one may want to continue along the road until it crosses the river. One would then need to backtrack a bit on the far side in order to enter the same, wide valley. After crossing the river, head up the broad valley until you reach about 1000 meter of elevation. Make a sharp right turn and climb a pretty easy, but steeper slope cutting south of the steep side that is part of Storsteinsfjellet itself. Aim for a shallow valley that starts at location N68.21938, E017.85468 above you. The elevation at this point is approximately 1320 meter. Continue up in the same direction with the steeper slope on your left hand side. 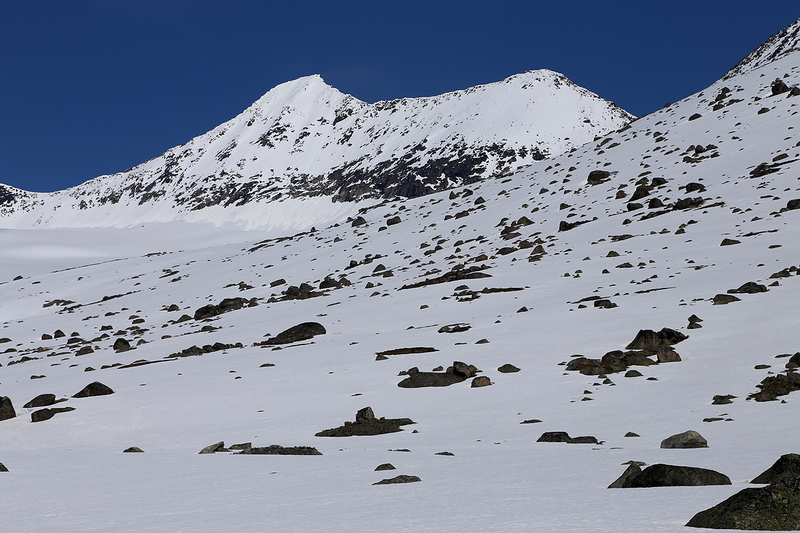 There is a ridge line with a col (map 1495 meter) up ahead. 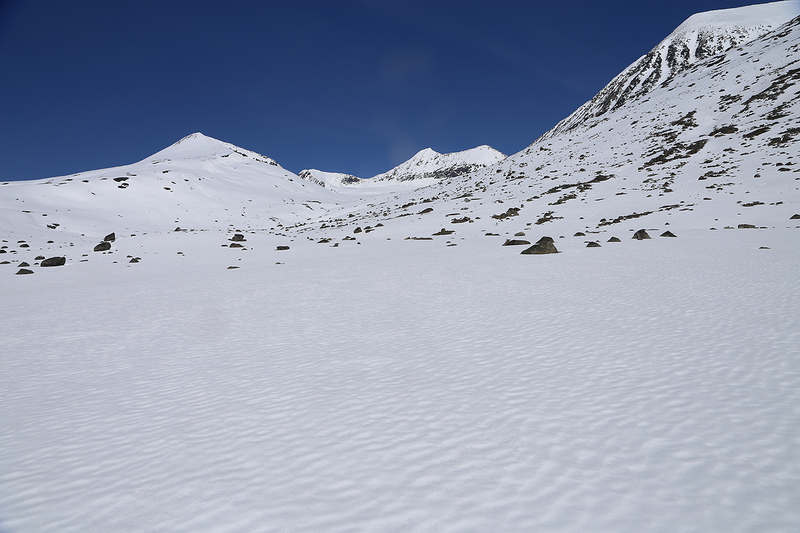 One may consider crossing a bit to the left (north) of the lowest col. The route enters the glacier at this point. With skiing conditions, one should stay on a large left turning curve, while keeping the steepness reasonable. The glacier is less steep as one moves further right, but the route also becomes somewhat longer. Continue up to the center part of the base of the final south face of the peak. This location is about N68.22967, E017.87844, elevation 1725 meter, or slightly below this point. If the conditions are good, then proceed directly up this steeper slope on foot. 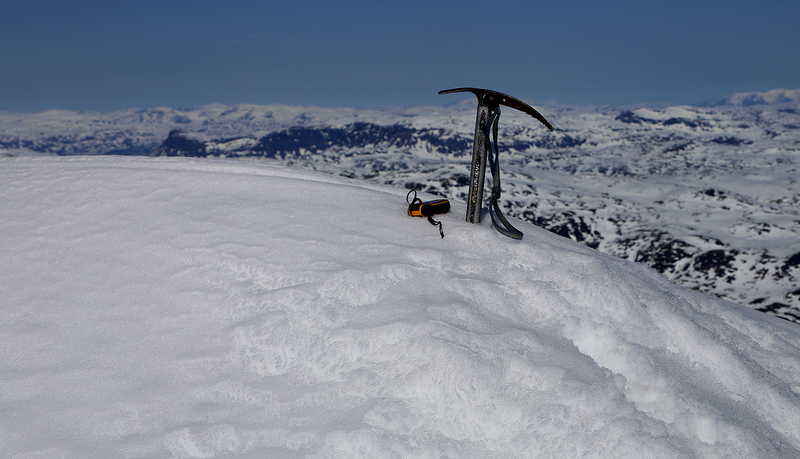 An ice axe and crampons may be needed. 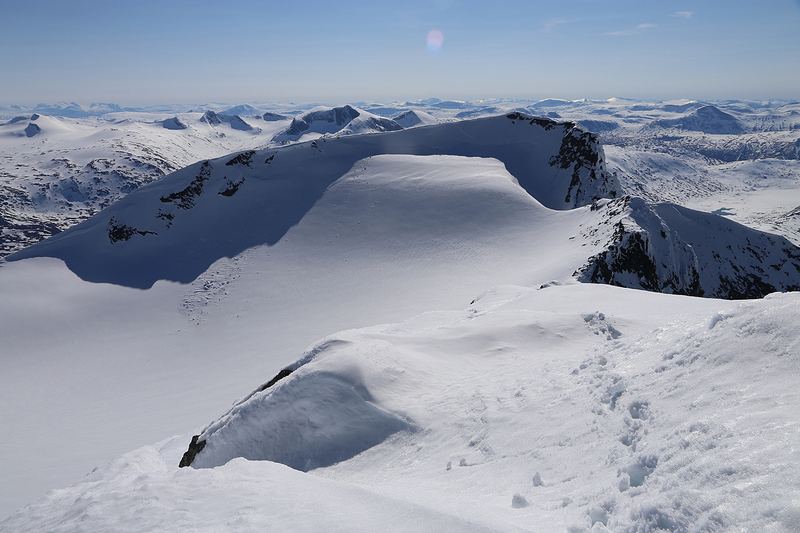 Alternatively, proceed left and gain the ridge which may subsequently be followed to the top. Be aware of possible bergschrunds and other crevasses when moving off the glacier. The final summit ridge is easy and the summit has a nice position. 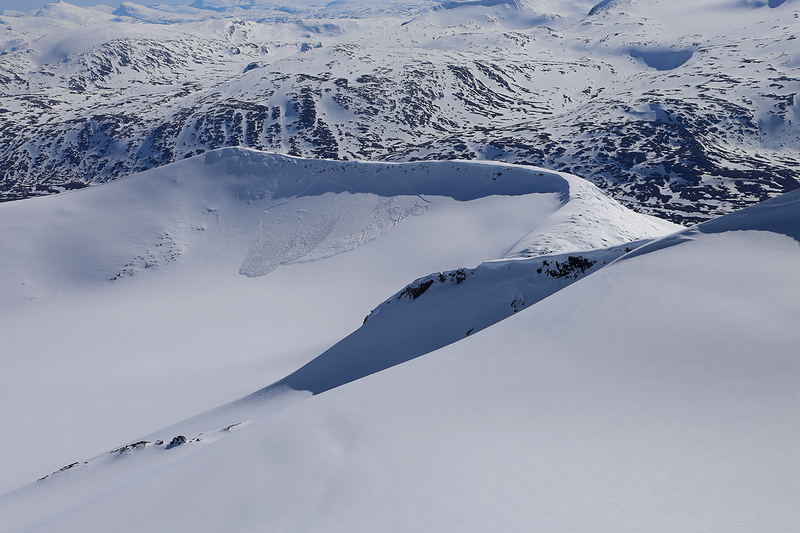 There is a shear cliff on the opposite side, be aware of snow cornices. I was staying in the nice DNT hut Skoddebergshytta with my two co-workers, Fran and Mike, after attending several meetings in Tromsø. This was a big climb and I decided to leave early. Thus, already around 0400, I was on my way. The drive from our hut to the trailhead is about 1.5 hours. 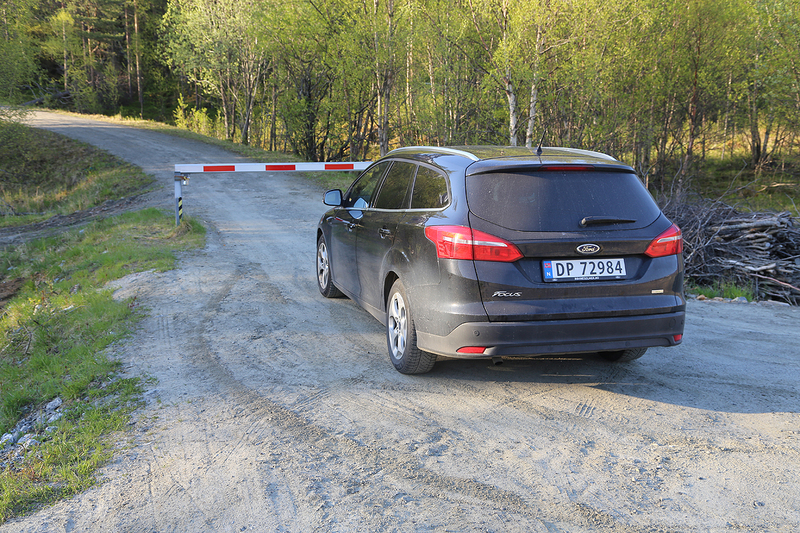 Arriving near the south end of the Skjomen valley, I was very surprised to find a locked gate blocking the road to Norddalen. Obviously, I needed to cope with this issue, as the round-trip walk from this location would be rather exessive. I drove back to the small turnout with information and located two phone numbers. One was a local responsible for the work being carried out related to the hydro power plants, the other was a local land owner. 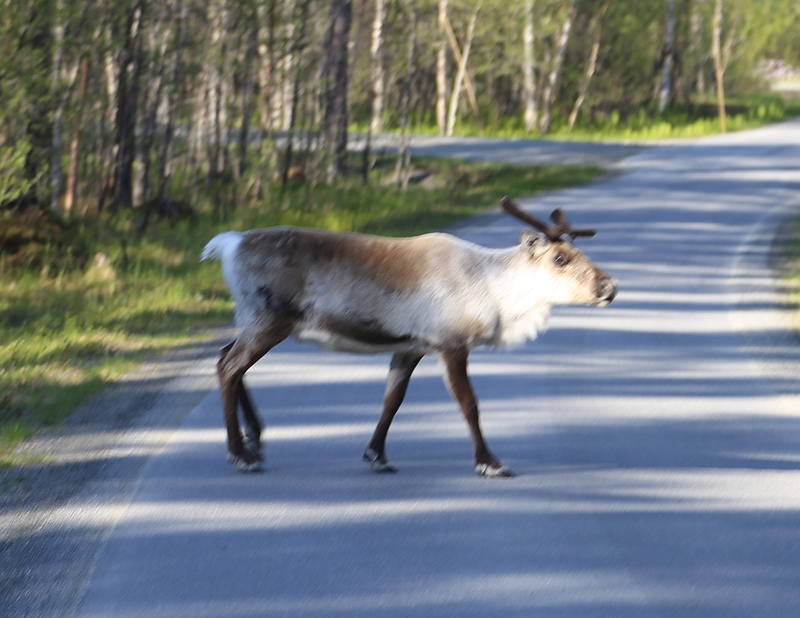 I tried the construction guy first, he was very friendly (as almost everybody in Northern Norway! ), but could not help since he had no links to this road. Next, the land owner, he was again very helpful, saying that he believed one of the two locks to be a combination lock. If I could drive back, then he could read me the code. Unfortunately, somewhat to his surprise, both locks (only one needed to be opened) were to be used with keys. I did not want to give up easily, thus I proceeded to call directory assistance and asked for Statkraft (the hydro power plant responsible). That lead me to a helpful lady in Narvik who in turn gave me the phone number to a person in the valley that actually was in possesion of the keys. Upon calling him, I touched on the first unfriendly, unhelpful man of the day. (There are very few such people in the north of Norway!) He mumbled that he received numerous request like mine every day (clearly false), then some concerns that I would surely park in such a way that the road would be blocked if they subsequently needed to use the road. His name was Jørgen Sivertsen, fortunately, there are few people like him. With Plan A (just driving) and Plan B (get the keys) failing, what about a Plan C? It was still early morning, but time was running. I clearly needed a bike. Where / How to borrow / rent a bike? It seemed like I at least needed to drive all the way back to the Skjomen center, the only place with more than single houses. Getting there, I slowly drove by the houses until I spottet a house with a bike outside. I immediately stopped, walked up to the house and rang the bell. Hoping that I was not disturbing peoples sleep (well before 0800), a man opened the door. I explained that I really needed to borrow/rent his bike. He was more than positive, "Of course you should use my bike", "Please put it back after use", "Oh absolutely not, you should not pay anything", "Have a very nice day in the mountains!". Fortunately, most people in Northern Norway are like this! This was more like it, very friendly when a complete stranger asks to use his bike very early in the morning. I put the bike in my car and drove back to the parking with the information signs. Strapping the skis and poles to the bike and getting all other gear into my backpack, I finally started out around 0830, about 3 hours delayed. 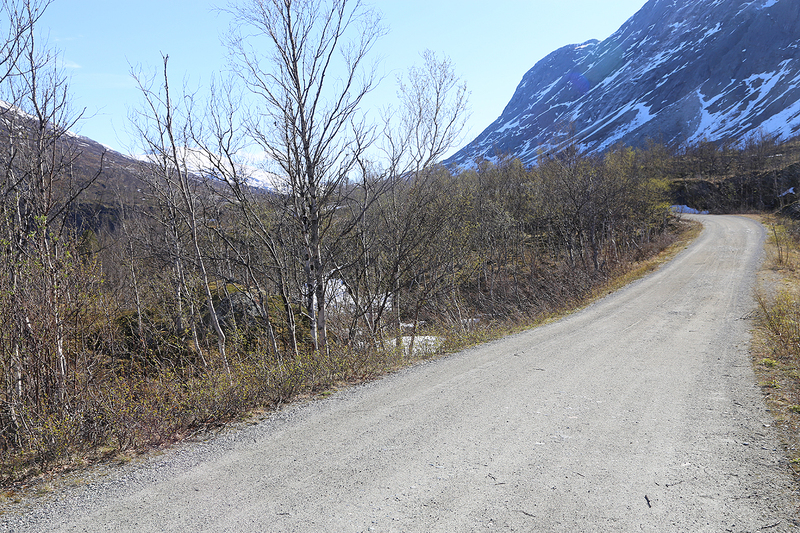 The road surface was pretty soft after the snow melt and at least in the beginning, the road had mostly uphills. I ended up walking the bike for long stretches. Also, as it turned out, an avalanche still blocked the road only a few kilometer after it started. In fact, driving had not been very useful, the use of a bike much better as I could easily lift the bike across the snow. Higher up, I similarly crossed at least 5 more banks of snow that still blocked the road for traffic. I arrived at the location opposite from the valley after 2:45, no doubt that this trip had turned into a bigger effort than anticipated. I took a calculated gamble that I would be able to cross the river near a small, red hut that I spotted on the other side of the river. This turned out to be true, lots of big rocks made it pretty easy to get across. 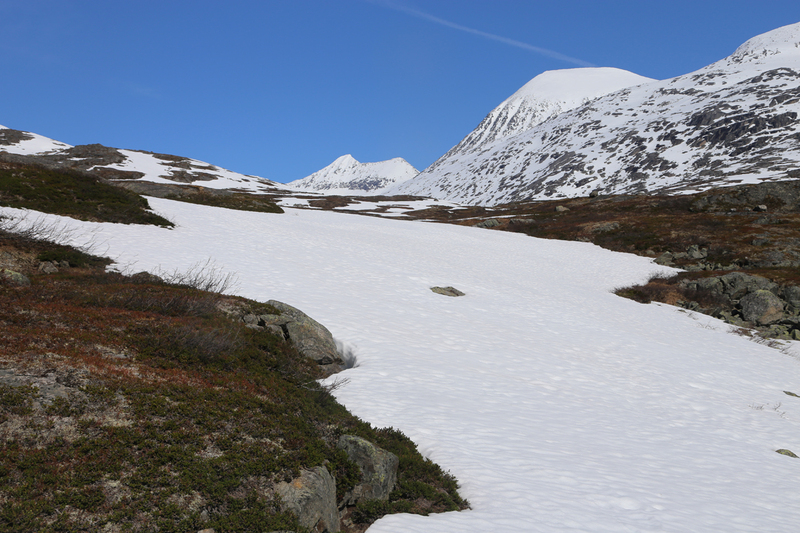 I continued uphill to almost 700 meter of elevation where a patch of snow provided the beginning of skiing. This snow connected and the skiing was nice. Soon, I turned right and ascended a steeper section to gain the shallow valley. 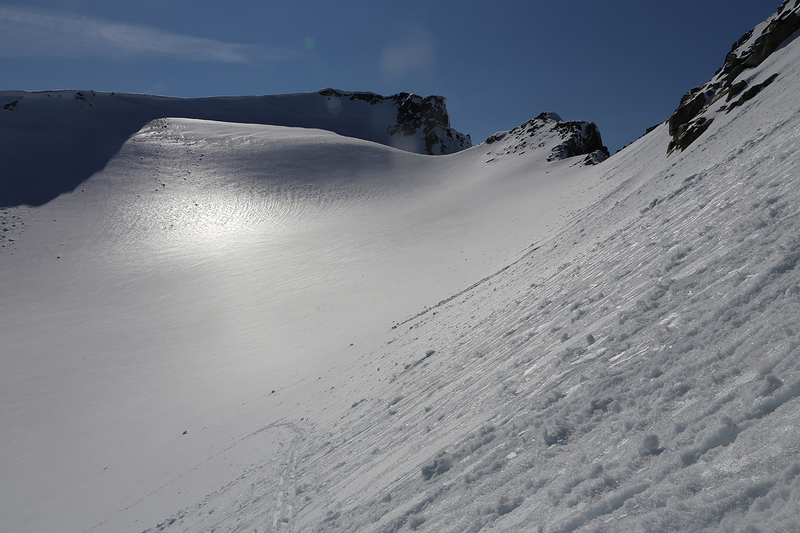 The route was easy to ski as I entered the glacier and skied up to the base of the south face. Finally, all that remained was a pretty steep ascent directly up the face to gain the summit. The time was 1530, the weather was fantastic, the scenery all around similarly good. 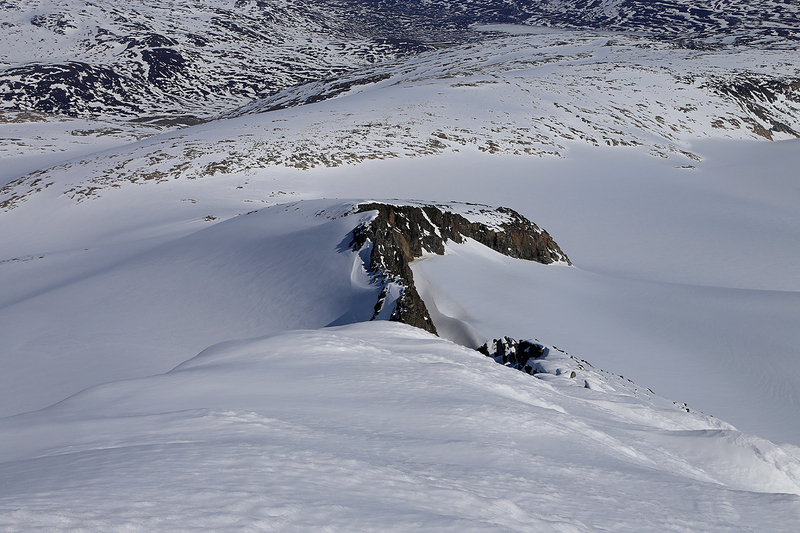 The cairn was completely buried and big cornices were overhanging the steep cliff to the north. I enjoyed the summit for about 15 minutes before heading back down in my footsteps. The skiing was nice and I was back at my bike by 1730. With a break as well as some time to attach my skis to the bike, I still had a very easy ride mostly downhill and arrived back at my car by 1830. I called Fran and Mike to tell that I would be late. Next, driving back down to Skjomen to deliver the bike. There, John Stiberg and his wife Trine Opdahl, were out in the garden. I thanked them warmly for great help and told that they really saved the day. 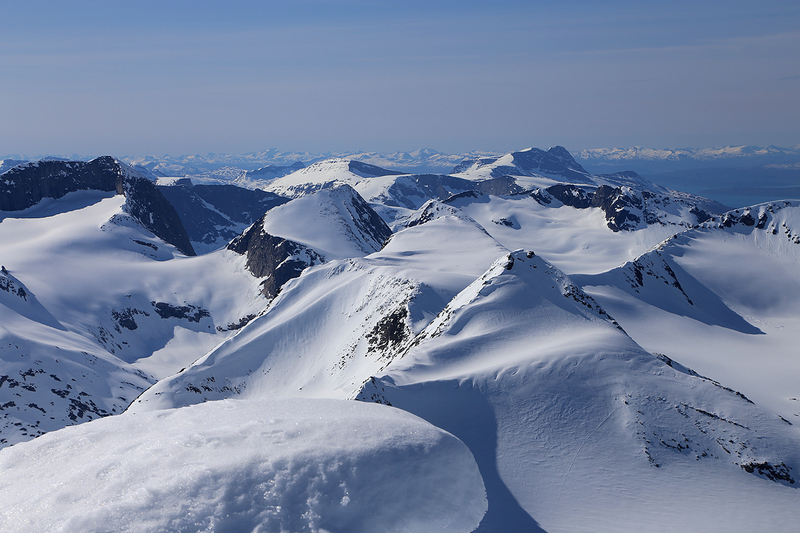 The NE ridge, as seen from the summit.